The primary purpose of a saddle is comfort for both the rider and the horse. Pads and stirrups provide support and security to the rider, while the saddle's frame redistributes the rider's weight to protect the horse's spine. 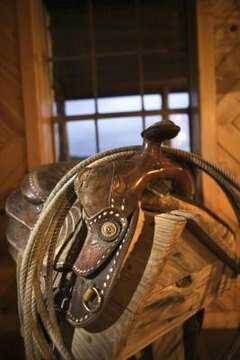 Beyond basic comfort, however, the Western saddle is foremost a working saddle, owing much of its design to the needs of cowboys as they herded their cattle across the plains. More than 4,000 years ago, saddles were little more than pieces of animal hide or cloth laid over the back of the horse. Around 700 B.C., Assyrian warriors in the Middle East began attaching girth straps to their cloths to hold them in place. The Scythians, riding in what is now Siberia, had more elaborate cushioned cloths with girths and stirrups during the fifth century B.C., but it wasn't until the fourth century A.D. that the first full-foot stirrup was used in China. Around 200 B.C., Asian riders began using felt saddles stretched across wooden frames. When the Moors invaded Spain in the 700s, they rode on horses atop saddles with long stirrups, high seat backs and front forks designed to provide them protection and security during battle. The Spaniards adapted these saddles for their own use, and the Spanish war saddle was born. When invading forces in the New World turned their focus from conquest to colonial expansion, they adapted their military saddles to help with ranching and farm work. These were stock saddles, precursors to modern Western saddles. As stock saddles evolved, two branches developed, corresponding to the needs of cowboys working in diverse climate and terrain. Ranchers east of the Rockies and into Canada used the Texican style. Texican saddles were large and plain, with large square skirts and double rigging that made them suitable for hard riding and long drives through dense brush. Further west along the Pacific coast and into the Northwest, a more laid-back ranching style led to lighter saddles with rounder skirts. These Californio saddles were often highly decorated. From the 1700s through the 1950s and beyond, saddle makers and riders continued to develop new features to enhance the Western saddle's utility. Not all modern Western saddles are designed for cowboys. The 1960s marked the beginning of highly specialized Western saddle types designed for everything from trail and pleasure riding to high-performance rodeo competition. The use of synthetic materials and the introduction of frames made out of fiberglass or stainless steel have made modern Western saddles lighter and longer lasting than historical models. How Long Have Horses Roamed the Earth?